Eurodollar is still consolidating. Possibly, price will start new descending movement in the nearest future. Target area for bears is formed by three fibo-levels: 161.8%, 78.6%, and 300%. As we can see at H1 chart, local correction was 78.6%. Yesterday pair reached new maximum inside one of temporary fibo-zones, which indicates possibility of reverse and new descending movement towards lower target levels. Franc is also being corrected. In the future, pair may complete flat pattern and start growing up towards its next target area. If later price rebounds from upper levels, market may start deeper and more serious correction. 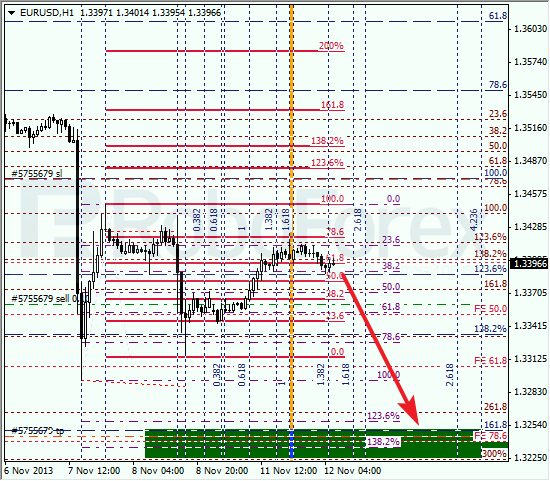 At H1 chart, local correction resulted in 50% pullback. In addition to that, market rebounded from temporary fibo-zone, meaning that it may start new ascending movement. Price may break maximum during the next several hours.